I’ll state this outright: I can’t stand Democratic Congresswoman Alexandria Ocasio-Cortez, or “AOC” as she’s often called, for reasons outside of politics. An unwritten rule exists that you must progressively earn your way into exercising power. The recent uproar involving Amazon’s (NASDAQ:AMZN) second headquarters and its decision to cancel its HQ2 proposal in Long Island City, Queens, perfectly reflects why this unwritten rule is so important. … but had she consulted with others before jumping on the “corporations are bad” bandwagon, she might have arrived at a different conclusion. This is why you earn your way. Contrary to stereotypes, our elders offer a wealth of knowledge. Now, Long Island City’s denizens must hope and pray that AOC and her cohorts made the right decision. Did they? Is the Cancellation of Amazon HQ2 Good for New York? I suspect that most of my readers believe that forcing Amazon out of Queens was an ignominious decision. As I referenced earlier, AMZN wasn’t exploiting cheap land to build old-school factories with the aim of exploiting cheap labor. Instead, Jeff Bezos & Co. wanted to bring high-tech jobs — jobs that would probably average around six figures. Here was a chance to renovate a city hurting for economic stimulus through an influx of economic activity. Even high-profile Democratic politicians, like New York City Mayor Bill de Blasio, championed the Amazon HQ2 proposal. But nothing occurs in a vacuum. While the move would have somewhat de-levered Amazon stock from its Seattle headquarters, the bid sparked controversies. Specifically, Ocasio-Cortez balked at the $3 billion incentives that the city and state would have provided AMZN. She argued, “we could invest those $3 billion in our district, ourselves, if we wanted to.” This entails hiring more teachers, fixing New York City’s infrastructure and other desired endeavors. The political wildfire spawned by this is going to get worse, which is unhealthy for Amazon stock. When I first read about the Amazon HQ2 cancellation, all I could think about was House Speaker Nancy Pelosi and her “clap back” meme. Based largely on political reasons, Long Island City residents will no longer benefit from one of the world’s greatest corporations. Certainly, I appreciate the nuisances that Amazon’s presence would spark. I live in southern California: Our freeways are a mess and are only getting messier with population growth. But I have nothing to complain about when discussing New York City. Its infrastructure is already atrociously congested. To not attract new businesses and talent, so that you could live “the quiet life?” If that’s the case, I don’t see any reason to live in a metropolitan area. You could move out to the boonies, divorced from humanity. No, people move to these major hubs because that’s where demand is strongest. Of course, it’s not fair nor equitable that most of the tech giants call Seattle and Silicon Valley home. Guess what? Life isn’t fair. Sadly, the opposition forces failed to represent their constituents. Rather than allow the affected to make that choice, overpaid politicians and a vocal minority made the choice for them. The real tragedy is that no other company will want to do business in Long Island City after this fiasco. Shame. Ultimately, I believe that the political elites will regret their opposition to Amazon HQ2. The best way to help people and communities is not through charity but through opportunity. Former President Barack Obama routinely mentioned the dignity of work. May I cut the BS and give you the real definition? It’s when white people move in and price people of color people out. For instance, northern California’s tech boom has made modest-income earners in that region practically unable to live there. 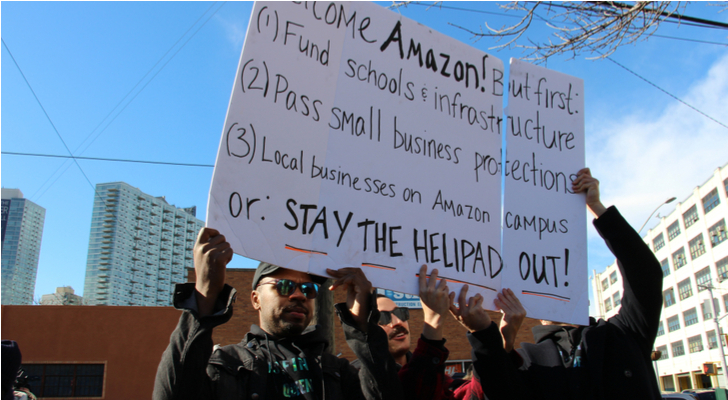 In that respect, civil rights advocates may consider the Amazon HQ2 cancellation a victory. But in the long run, I’m not sure that this was the right move. According to the Chicago Tribune, racist dynamics in real estate hurt black homeowners to the tune of $48,000. In short, white people and businesses avoid black neighborhoods, thereby collectively deflating black wealth. Although it’s a complicated and controversial situation, it appears that the best answer is to incentivize companies to invest in underdeveloped or impoverished neighborhoods … but that’s exactly what the original HQ2 proposal called for! If AMZN touched down in Long Island, it’s gentrification. If they avoided the city, it’s white flight. No matter what, Amazon stock absorbs the PR stain. The wrinkle here is that Amazon HQ2 will go ahead with its Northern Virginia proposal. That’s regional equity. But it also keeps white neighborhoods white, and black neighborhoods black, worsening the problem that HQ2 could have addressed. Article printed from InvestorPlace Media, https://investorplace.com/2019/02/ocasio-cortez-amazon-hq2-amzn-stock-fimg/.